No other team in the National Football League has won more championships than the Green Bay Packers. Since 1929, they have won 13 championships and five Super Bowls--the most recent in 2011. They are one of the league's oldest franchises, and the familiar green and yellow uniforms have thousands of fans around the country. The Green Bay Packers are part of the NFC North Division, with rivals Chicago Bears, Detroit Lions, and Minnesota Vikings. Go to Packers.com for more information, or click here for their 2013 schedule. George Calhoun and Curly Lambeau organized the first team in 1919. Lambeau's employer, the Indian Packing Company, picked up the cost for the jerseys and let the team play on its athletic field. It seemed only natural that the team would then be called the "Packers," even though the company phased out its participation halfway through the first season. The Packers became a franchise in 1921 after a successful first season, and after a few rocky setbacks, the team has thrived for over nine decades and 14 coaches. Lambeau Field, where the Packers play, was named for its original owner and first coach. Throughout the years, Hall of Fame players such as Bart Starr, Forrest Gregg, Paul Hornung and Ray Nitschke have all worn a Packers uniform...making them a powerhouse team. Perhaps the most famous era was when Vince Lombardi led the Packers, from 1959-1967. During his tenure, the Packers won championships in 1961, 1962, and 1965-67. His coaching skill became the standard for football excellence...with his reputation standing as one of the greatest men to ever coach in the NFL. Dedicated in September 1957 against their biggest rivals, the Chicago Bears, Lambeau Field is located at 1265 Lombardi Avenue in southwest Green Bay. It was originally named City Stadium but was changed to Lambeau Field in 1965 after the death of Curly Lambeau. It holds a capacity of 73,142 people, and though many changes and upgrades have taken place, it has maintained its original "seating bowl." 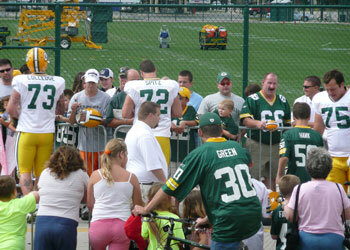 The stadium is used year 'round for various events and is visited by Packers fans worldwide. The 25,000 square foot Packers Hall of Fame is located on the stadium's east side, as well as facilites for up to 1,200 people. 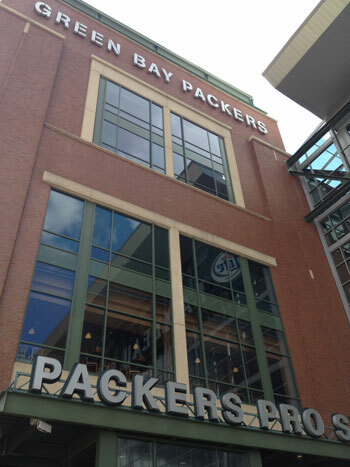 Various eateries and Curly's Pub are also located here, along with retail stores and the Packers Pro Shop. Outside the five-story atrium are bronze statues of Curly Lambeau and Vince Lombardi...two men who formed and shaped the Green Bay Packers. The Green Bay Packers are one of the NFL's most legendary teams. Purchase a ticket and enjoy a fall football game against some of their biggest rivals in the NFC and NFL.